Stranger Things (R) is an American science fiction-horror web television series. Set in the fictional town of Hawkins, Indiana, in the 1980s, the TV show focuses on the investigation into the disappearance of a young boy amid supernatural events occurring around the town, including the appearance of a girl with psychokinetic abilities who helps the missing boy’s friends in their own search. The second season is set a year later, starting in October 1984. Will has been rescued, but few know of the details of the events. 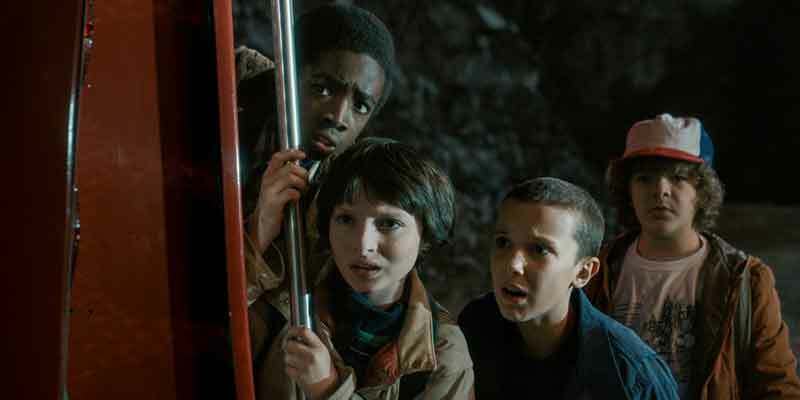 When it is discovered that Will is still being influenced by entities from the Upside Down, his friends and family learn there is a larger threat to their universe from the Upside Down. The series has received several industry nominations and awards, including winning the Screen Actors Guild Award for Outstanding Performance by an Ensemble in a Drama Series in 2016, and receiving eighteen nominations for the 69th Primetime Emmy Awards, including Outstanding Drama Series. Stranger Things is a Netflix Original. The TV show can only be found there. Netflix is an on-demand streaming service. Netflix lets you binge-watch entire seasons of Stranger Things. This is a very inexpensive way to catch this amazing TV show as plans begin at $7.99/month. To learn more about this service read our Netflix review. This TV show can be found on just about any streaming device on the market. You can stream on a tablet, smart phone, gaming console, desktop, or a streaming device such as a Roku, Apple TV, Chromecast, AirTV, Amazon Fire TV, and more. Here are some of the top devices that can be used to access one of the services that carry Stranger Things. To learn more click on the icons below or read our streaming device guide. Stranger Things can be streamed using a VPN. A VPN can unlock content from services such as Netflix. You can also use a VPN to bypass blackout restrictions and geo-blocking. A VPN will increase your online security and protect your online devices. This is very useful in the United States but is even more useful internationally. By using a VPN you can view this TV show while in another country. Not every VPN is created equally so we have chosen a few that we believe to be the best VPNs to pair with streaming services such as: ExpressVPN, NordVPN, and CyberGhost VPN.